I’m 1 week away from my first ultramarathon. 50km of trails, sunshine, and spectacular views. I’m excited! What is an ultra, you might ask? It’s any distance longer than a marathon (26.2 miles). So it could be 50km (which is ~31 miles), 50 miles, 100 miles, or it could even be an all-you-can-run for a certain amount of time. Like everyone runs as many loops as they can in 12 or 24 hours. I’ll be running the Woodside/Purisima Creek Crossover 50K next Sunday. There isn’t much pressure, because I don’t have a time goal. I’m completely new to ultras and to trail running, so I don’t know what to expect, really. I’m used to running road marathons, where the roads are cement. So running through the soft soil in the forest is definitely new to me. Also, I’ll be running with a camelbak so I can carry water and snacks. This is way different from the water stations every 2-3 miles that I’m used to. And third, I don’t think the roads will be blocked off. I’m used to roads and sections of streets completely blocked off to traffic, guarded by police officers, and lined with spectators (sometimes sparsely). But at the ultra, I think the roads are open to anyone, so I’ll need to work harder to make sure I don’t get lost or take a wrong path. Better: Maintain an even effort throughout the entire race. Best: Fuel myself properly so that I don’t bonk or hit a wall during the race (while finishing the race with even effort). My strategy? I’m going to try to maintain an even effort from the start. I’ll keep in mind that I’ll be running for about 6 hours, and to fuel with a GU energy gel or KIND bar or turkey/beef jerkey stick every 30 minutes. My left heel has been acting up, so I need to monitor it. When I did my speedwork last Wednesday (5 mile repeats at 6:30 pace), I pushed it. 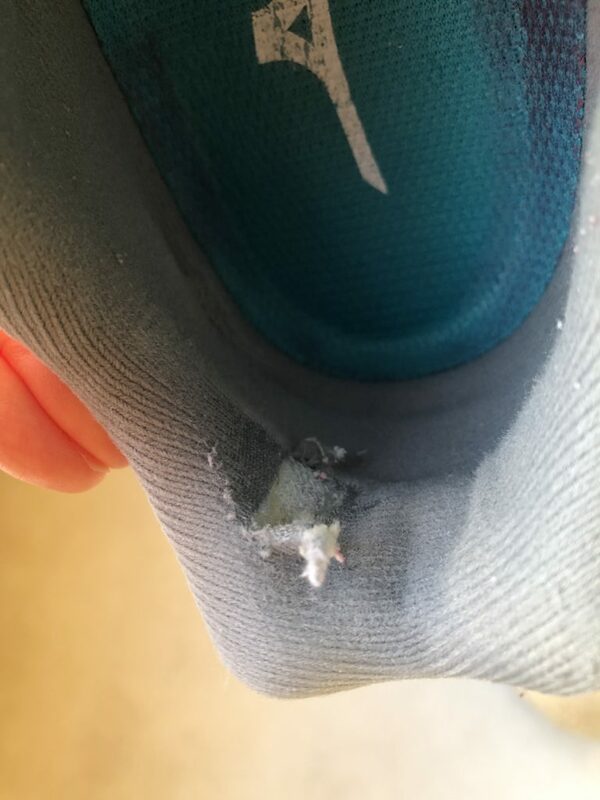 My heel was rubbing against the back of my shoe and it was starting to feel pretty raw and tender. I pushed it for the final mile repeat though, and when I finished, I couldn’t jog the cool-down back to the office. When I got back, I was relieved to see it was just a blister (a blister is way easier to heal than an issue with a muscle or ligament). But it was a nice and juicy blister. I’ve popped it and drained it, but it’s still feel very tender whenever I try to run. The tender heel has been bothering me since yesterday. I was supposed to run 15 miles, but cut it short after 4 miles. 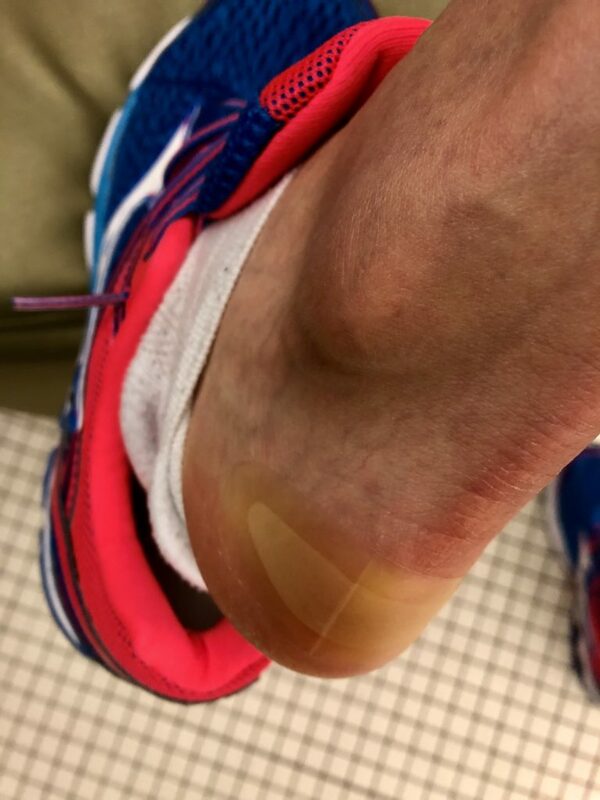 I didn’t want to reopen the blister or form a new one, so close to my 50k race. Today, I headed to Target to pick up these bad boys. I didn’t know which ones to get, so I got both. The Band-Aid Hydro-Seal bandages are designed to help heal heel blisters. But, they said that a bubble would form within 24 hours. I wasn’t sure that a big bubble would be good, or would even cause more problems. 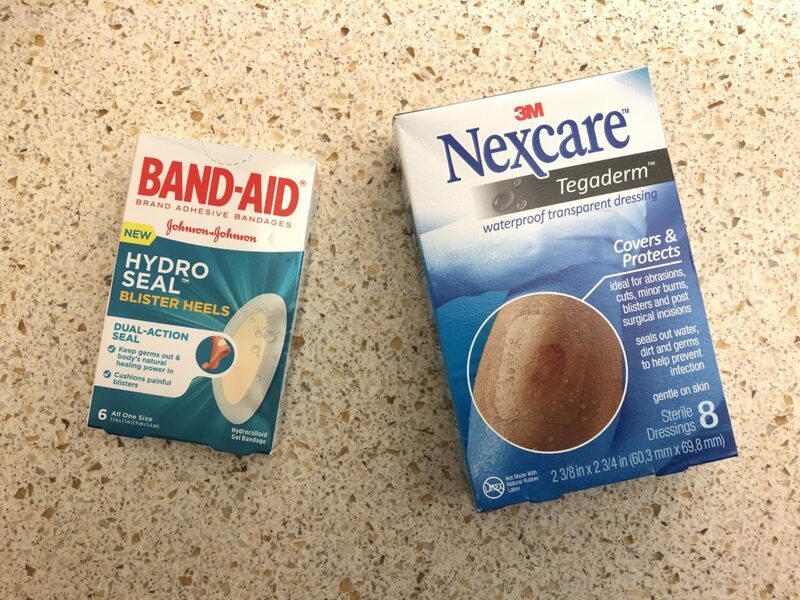 The other one (Nexcare Tegaderm dressing on the right seemed like an extra layer of protective and see-through protection. Just an extra layer to buffer the blister. I haven’t tried these yet, but I’m thinking of using them for areas on my foot that are prone to blisters, as more of a prevention measure. Not bad, Band-Aid Hydro-Seal. Not bad. Anyway, I applied the Band-Aid blister heel bandages and was pleasantly surprised by the comfort. They held up nicely on my 8 mile run today. I mean, I could still feel my blistered heel. I didn’t forget about it completely. But it did feel good enough for me to go out on my run today, which was good enough for me. Coach Ben had advised 8 miles today, and to push it to 12 miles, but only if it felt good. It felt “fine” but not “great,” so I kept it to 8. Other than the heel, everything else feels great. After a visit to my physical therapist a week and a half ago, my plantar fasciitis went away. He massaged my foot and gave me some plantar strengthening exercises, and all was well. A miracle worker, I tell you. I’m also picking up new orthotics this Wednesday. I went to a podiatrist 2 weeks ago to get a mold of my feet and now new orthotics will be hugging my feet. Hope you’re all having a great Sunday. The weather has been amazing lately with temperatures in the high 60s, and it feels like spring has finally arrived!